Discover the most amazing things to do with kids on the Costa del Sol. Your children will definitely love the countless activities offered in the province of Malaga. Whether you are looking forward to feeling the adrenaline running through your veins, or you just want to relax during your family holiday with kids, this is the post that you need to go through right now! Here you will find all the information regarding the best things to do with kids on the Costa del Sol, be it a day at the waterpark, a discovery of the most amazing animals in a zoo, or a fun tour around the most picturesque towns on the Costa del Sol. Don’t miss out on the countless possibilities offered by this area of Andalucia. Tip: book your tickets online and you will receive a discount on the original price. Just click on the title and you will be redirected to the official web page of the parks and activities displayed here. The largest water park on the Costa del Sol features waterslides for children and adults, as well as pools where the littlest ones can enjoy themselves in complete safety, in the Kidzworld area. 12 adrenaline water slides, among which the tallest, 22-meter-high Kamikaze stands out, will let you know what fun feels like; and if you just want to chill out with your kids, enjoy the enormous Jacuzzi and the 1440 square meters wide pool, where 1-mt-tall waves will make it impossible for you and your family to not spend a great day of fun. You can either bring your meal from home or let the restaurants’ buffets and menu à la carte surprise you. Just remember that if you choose to bring your own meal, no glass container can be brought into the park. Provided with 14 between waterslides and pools, alongside shops, bars, restaurants, a changing room and an infirmary, this water park also offers special prices and discounts for families willing to spend a fun day at the park. Just check on their website to keep yourself updated with the latest offers. 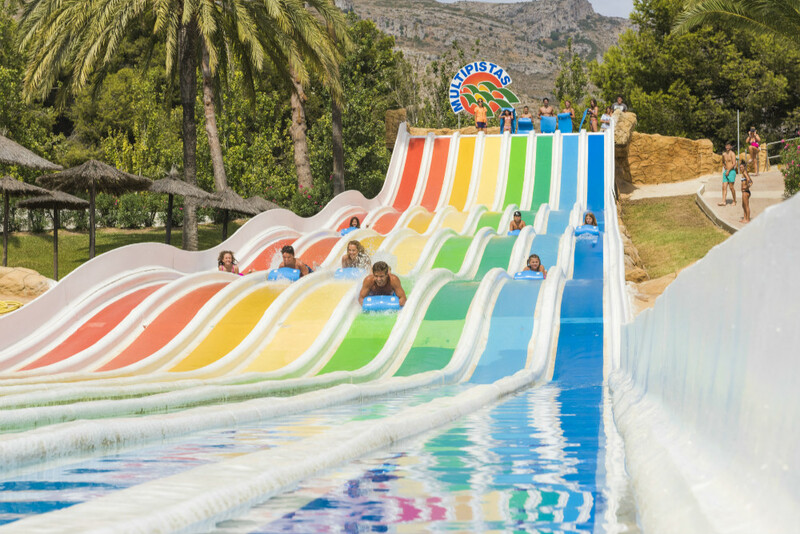 One of the oldest water parks on the Costa del Sol, the Aquavelis Waterpark offers a tall waterslide, a children’s area and pools to spend your family day in the best way possible. Despite not being an actual waterpark, your kids will love the feeling of playing right on the waters of the Mediterranean Sea. 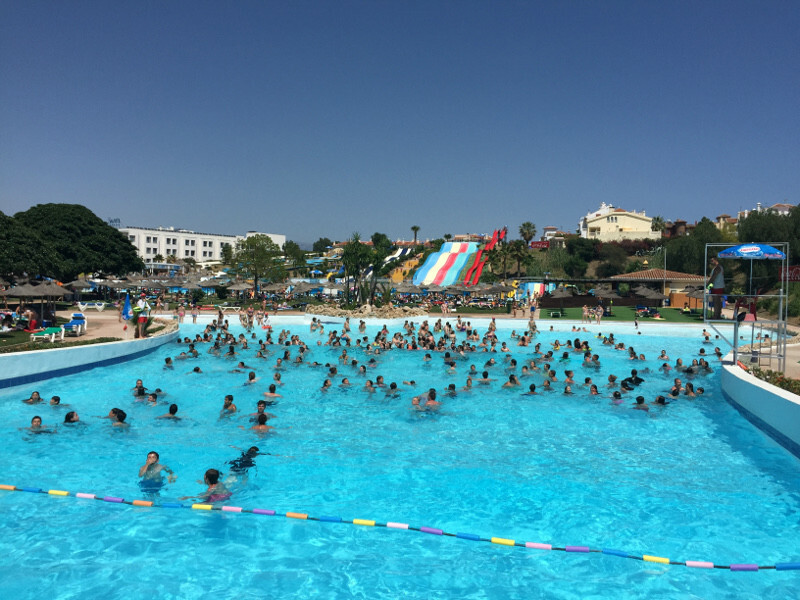 In fact, the Costa Water Park is an inflatable, floating obstacle course located 70 metres far from the beach of Fuengirola. You can move from one obstacle to the other thanks to floating donuts that can be borrowed or rented. Kids have to be good swimmers to take part in the course since the waters are deep in this area. However, there are areas specially designed for resting. Tickets (€10/hour) can be bought in nearby shops. Open all year round, this Crocodile Park is the perfect area to visit with your kids during a family trip to Malaga, especially if you have a reptile lover in the family. Home to more than 200 crocodiles, you will have the chance to pet a baby crocodile and engage in a guided tour, every day at 12:30 pm, 2.30 pm, and 4.30 pm. And you will also have the chance to meet Europe’s biggest crocodile, Paco. This park redefined the rules of the zoo when it opened in 2001. It is home to exotic animals such as lemurs, hundred-year-old tortoises, reptiles, tigers, gorillas, and much more. But the most important feature of this park located in the heart of Fuengirola is definitely its breeding plan for endangered species. Your kids will love watching magnificent animals having their dinner and know that many of them were born thanks to the program carried out by the centre. Supported by various projects that help rescue the maritime fauna, this aquarium will leave the little (and not-so-little) ones with their mouth wide open. You and your family can take a tour in the hallways while a majestic shark swims right above you, or wait for the animals to be fed and accompany them during their dinner. The only marine park in Andalucia offers your children the possibility to get to know dolphins, penguins, sea lions and other maritime fauna in a friendly environment. The park is also committed to the preservation of the species that live here and works with schools to let the pupils know about the importance of preserving the environment. You can check the opening hours of Selwo Marina by clicking here. Sibling of Selwo Marina, Selwo Aventura is the place your kids wouldn’t want to leave for anything in the world. In fact, they can spot the animals in their natural environment, like a safari but just 1-hour drive from Malaga. You can check the opening hours of Selwo Aventura by clicking here. 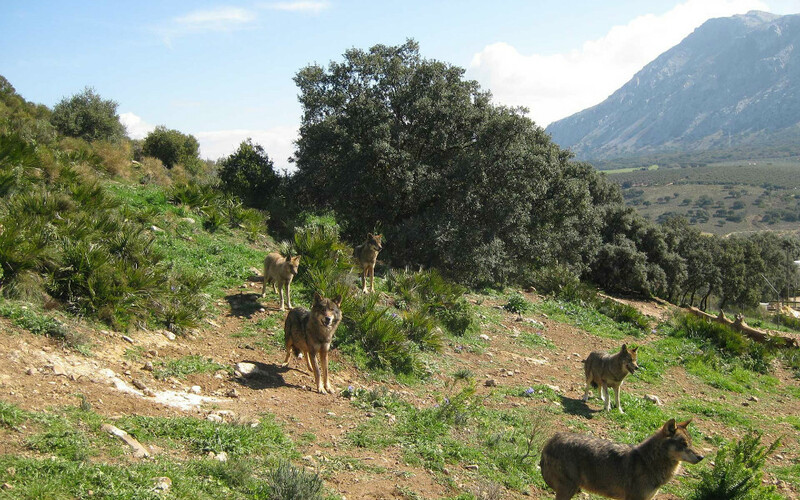 If you want to get the chance to spot the wolves in their natural habitat, you can’t miss out on the 400.000 square metre Wolf Park of Antequera, in the heart of Andalucia. You will be given a guided tour to get to know the social hierarchy of the wolves that live in the park. You can check the opening hours of Lobo Park by clicking here. This Donkey Sanctuary lives on the donations made by those who visit it. If your children love animals, here they will have the chance to pet rescue donkeys and even adopt one, while getting to know the stories behind each one of them. The sanctuary is located less than 1-hour drive from Malaga, in an ancient farmhouse in Fuente de Piedra, close to the famous Flamingo Lake. If you (and your children) don’t mind heights, a trip up to Mount Calamorro is a must while on the Costa del Sol. Take the cable car that leaves from the Tivoli World parking and after a 15-minute trip, you’ll get to the top of the mountain behind Benalmádena. The views from here are out of this world, or at least of this continent since you can easily spot the African coast during clear-sky days. Home to rabbits, peacocks, ducks, swans and turtles among others, your children won’t have it hard to make friends during an afternoon trip to the Parque de la Paloma. Opened in 1995, this 200.000 square meters wide park is a favourite relaxing spots among tourists and locals. Stroll among lakes, blossom trees and concrete paths, and rest in one of the kiosks and cafes that are spread all over the park. One of the biggest amusement parks in Andalucia, Tivoli World offers the whole family a day of fun, among carousels, shows, thematic restaurants, shops and much more. You’ll just have to experience it for yourself to believe us when we say that this park is truly worth a stop while on the Costa del Sol. If you love to put yourself to test, the Aventura Amazonia is what suits you. With 6 circuits provided with 83 challenges and 20 zip lines, a child-friendly area for children up to 7-years-old, and the tallest zip line in Andalucia (a jump of 240 Mt awaits you!). You can check the opening hours of Aventura Amazonia by clicking here. Any chocolate lover here? If so, don’t miss out on the smallest chocolate factory you’ll ever see. 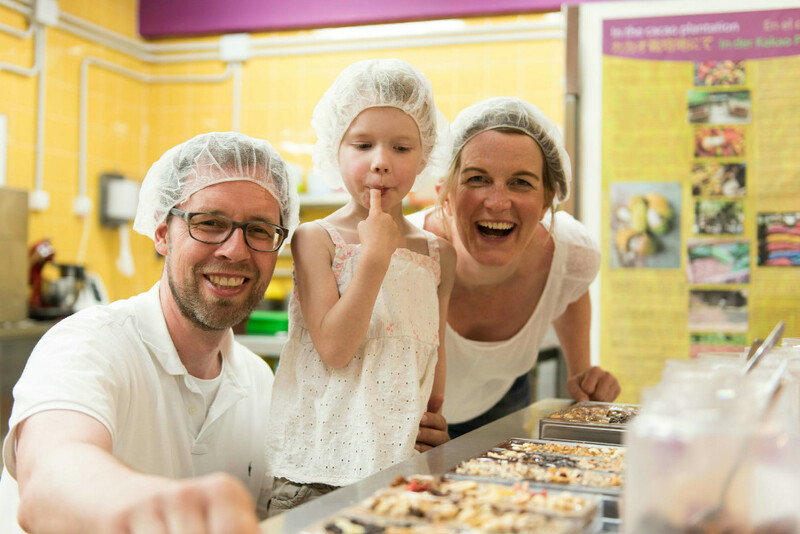 Located in Mijas’s city centre, you will have the chance to taste delicious chocolate ice cream with warm chocolate toppings and even make your own chocolate bars during a workshop. You can create them among dark, milk and white chocolate. At the end of the visit, and for the joy of your children, the chocolate bars will go back home with you. You can check the workshop hours of Mayan Monkey by clicking here. A family trip to the Costa del Sol can’t be called complete unless you don’t go kayaking between Maro and Nerja. The crystal-clear water that surrounds the unspoilt natural environment makes it hard to believe that you are in southern Spain. Children will thank you after you let them enjoy kayaking. They will commit to distinguish the fishes below the water surface, as well as spot the mountain goats that live in the Natural Park of Maro – Cerro Gordo. Check the company Educare Aventura to arrange your trip to the coves of Maro. Heights don’t scare you, do they? Then Parasailing is a great way to discover the Costa del Sol. Enjoy the stunning views and the adrenaline provoked by a boat carrying you around the Mediterranean Sea. 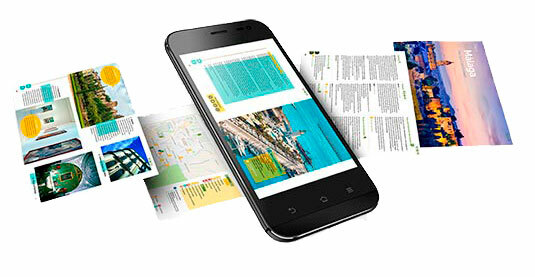 There are various companies disseminated along the seashores of the Costa del Sol offering this service. In order to engage in each and every one of the activities reported above, you need a place to stay and recharge batteries. Don’t worry about that, we got you covered! In fact, we offer you a wide selection of the best holiday homes and villas on the Costa del Sol. Private pool, out-of-this-world views, well-maintained gardens and the possibility to bring your beloved pet with you are just some of the features of these accommodations in the province of Malaga. Don’t let them slip through your fingers! Private pool, views out of this world, well-maintained gardens and the possibility to bring your beloved pet with you are just some of the features of these accommodations in the province of Malaga. Don’t let them slip through your fingers! BOOK A VILLA ON THE COSTA DEL SOL! We are sure that this blog post about the things to do with kids on the Costa del Sol has provided you with interesting ideas to keep your children occupied during your holidays in Malaga. Which are your favourite things to do with kids on the Costa del Sol? Which activity do you think your kids will love the most? Tell us in the comments below!